New in 2016, this 10-inch Cissette doll comes from the "Mystery Dolls" line, which won an award for the coveted Fashion Academy Gold Medal" . Known only as 'The Mystery Dolls,' Madame Alexander created six extraordinary dolls in 1951. Having never appeared in the Alexander catalogs, very little is known of these beautiful ladies. How many were made? Who were they inspired by? We may never know. What we do know is that Madame Alexander won a coveted 'Fashion Academy Gold Medal' for the originals. In 2016, Madame Alexander introduces the first 3 shadow Cissettes. Arlene dazzles in her flowing, purple floor lenth ball gown. A waterfall of flowers cascades across her bodice and skirt. Her soft auburn hair is styled in a beautiful chignon with rhinestone accents. Her drop earring and pearl necklace add a classy and refined final accent to this lovely lady. 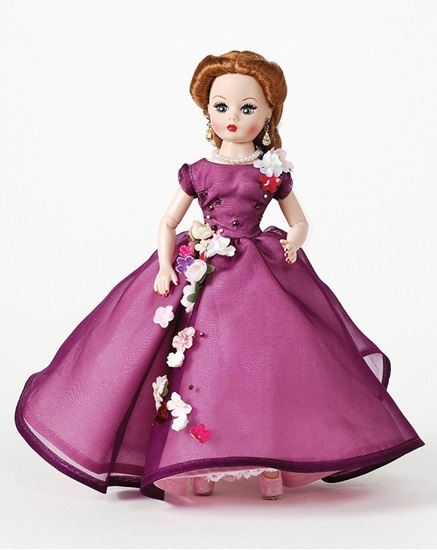 Arlene is a 10-inch Cissette with fully articulated arms and legs and grey sleep eyes. Suitable for ages 14 and up.